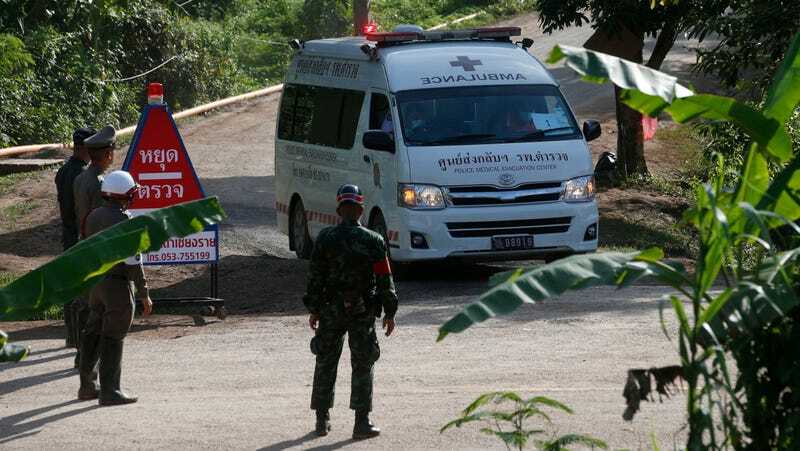 Earlier today, an ambulance with flashing lights leaves the cave rescue area in Mae Sai, Chiang Rai province, northern Thailand. After nearly two agonizing weeks in Thailand, things are starting to look brighter for the 12 trapped boys and their 25-year-old coach. Four members of the Wild Boar soccer team were rescued on Sunday, and, as CNN reports, another four were pulled out today. That leaves four boys and the coach, who are going to have wait a bit longer to be rescued as operations have been suspended for the day. The first boy to emerge today left the scene in a helicopter just before 4:30pm local time. He was taken to a hospital in Chiang Rai for a medical evaluation. Two more boys were escorted from the cave a short time later, followed by a fourth. Thai officials said the boys were hungry but are in good health, according to The Telegraph. All eight of the rescued boys have been placed in quarantine to prevent them from contracting infections while in their weakened state, and to prevent others from coming into contact with any potential pathogens they may have contracted while trapped deep within the cave system. The boys and their coach ventured into the caves on June 23, but they became trapped when flood waters blocked the route back to the entrance. Expert divers found the team huddled on a steep rock some 2.5 miles (4 km) from the mouth of the cave on July 2. On Friday, July 6, a former Royal Thai Navy special operations diver, Saman Gunan, died while delivering oxygen tanks to the cave, underscoring just how dangerous it is to swim through the submerged sections.